Fossil Fuel Exports on the Columbia River? 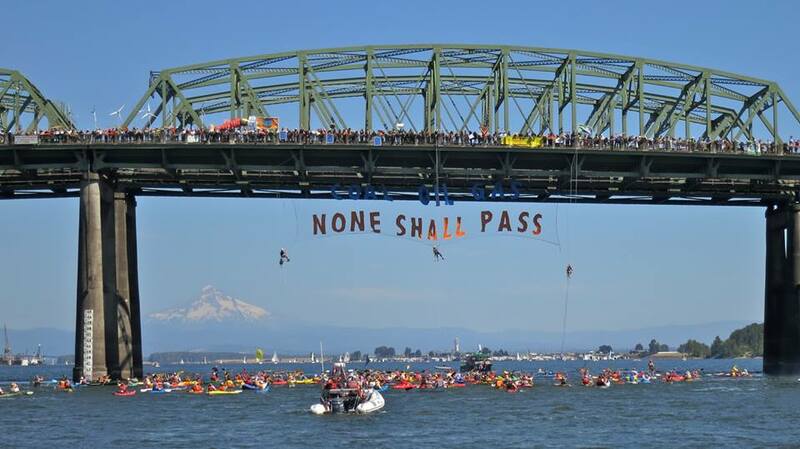 Saturday July 27th, 2013, in a day-long affair involving hundreds of activists, the Portland Rising Tide and 350.org collaboration, Summer Heat, went off yesterday without a hitch. Activists congregated in the morning at the Vancouver Landing in Vancouver, Washington, where this week port authorities approved a terminal to ship hundreds of thousands of barrels of oil carried on trains from the Bakken Shale. Hosting info sessions about secret corporate trade agreements, direct action, and infrastructure resistance, the event carried a festive air into the early afternoon. 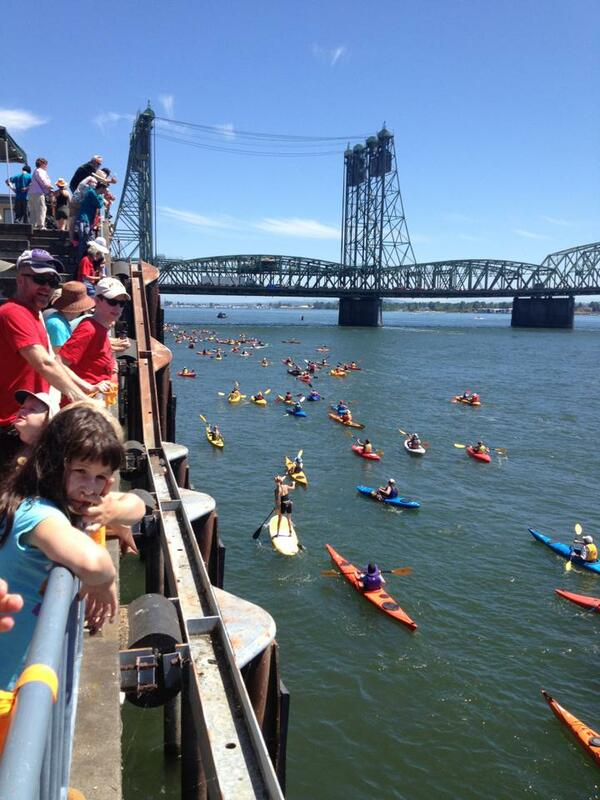 By 3pm, around 250 activists in more than 100 boats took to the river for a symbolic blockade and massed under the Columbia Bridge. The crowd that came out to the protest showed that they will not be intimidated. Police presence was relatively minimal at the protest compared to other Rising Tide and Occupy actions that have occurred. Nobody was arrested, and the message was sent: Expect Resistance. 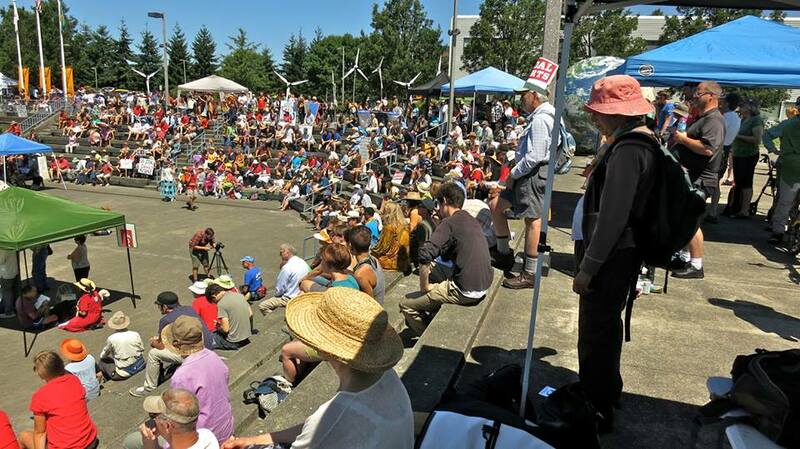 Summer Heat was only a high point in what has been a long, hard, and in many ways successful struggle, which has seen three three proposed coal terminals shut down so far. Today, Portland Rising Tide looks invigorated, confident, and more dedicated than ever to the mission of stopping climate change. Mary Pipher’s new book is a wonderful description of the trauma, anxiety, joy and comfort of facing the impossible by coming together to take action against the odds. 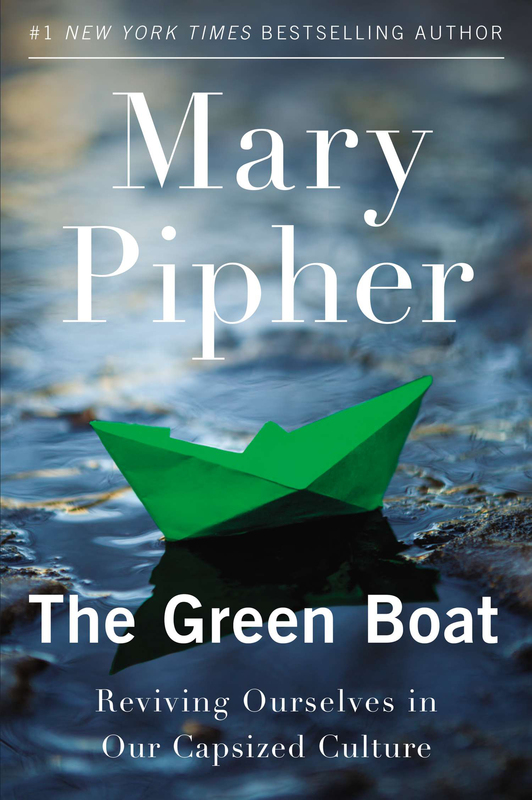 Click on the link above to listen to “Living On Earth” radio interview with Mary Pipher, best-selling author of Reviving Ophelia, as she describes her inspiring journey into activism, and discusses her new book, The Green Boat, Reviving Ourselves in Our Capsized Culture. In her interviews, her actions, and in her book, she says it much better than I can, so check your speaker volume and tune in. A grandmother herself, Mary Pipher turns her attention to the psychological roots of our difficulty in facing and addressing climate change, and to her own struggle against despair, trying to cope with the impending loss of everything we care for, which led her to take action in her community. Now enjoy Video (below) of the Grandmothers Apple Pie Brigade, a group Mary Pipher helped found with her friends and neighbors to take on the Keystone XL pipeline when it came to her home in Nebraska. An unlikely group of activists comes together to spread a unifying vision of what makes home.